Free Flowing Indoor Garden Terrariums. These fantastic terrarium indoor garden planter makes "the" most perfect gift for the city-dwelling botanist. These exceptional free-flowing terrarium planters were inspired by the organic shapes found in mid century modern Danish glass design. Highly decorative in form, these finely crafted glass terrarium planters create a relaxing and peaceful display. The terrarium planters are fashioned from recycled glass by master glass blowers. 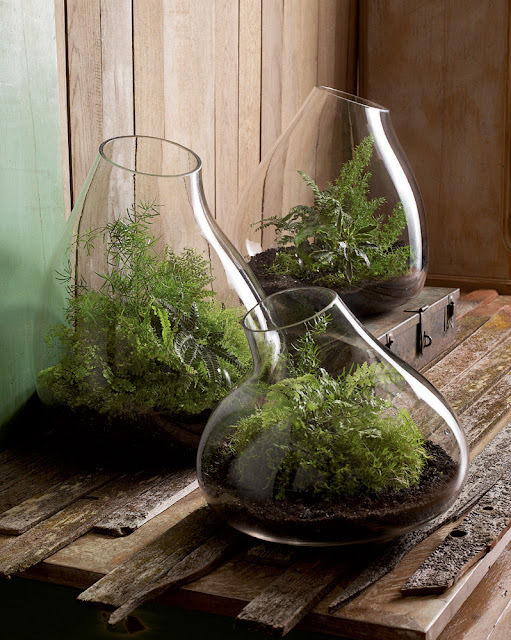 Bubbles, dimples, rippling and natural flow marks add to the artisan appeal of these terrarium planters. Each vessel is unique and is made with at least 50% recycled glass content.